Today, synthetic tennis courts are rising in popularity because of their durability, practicality and convenience. For athletes and sports enthusiasts who want a low maintenance court without compromising performance level, a synthetic court may be right for you - they can stand unpredictable weather and they can be used all-year round. Sports, such as tennis, are usually played on natural grass, clay, and carpet surfaces. However, these courts are less preferred these days because they require high maintenance routines that are quite costly. Thus, tennis players go for synthetic playing surfaces to be able to enjoy their hobby without having to worry about the up keeps. 1. Plan and determine a strategic location. 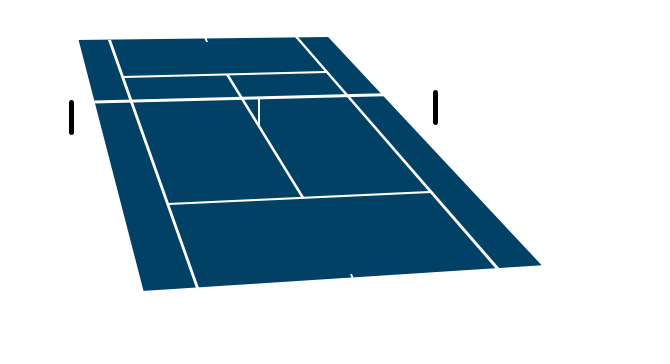 A standard tennis court measures 78-foot by 36-foot rectangle, which is big enough for singles and doubles games. So you should choose a huge, open location to make sure that your synthetic court can be accommodated. 2. Get rid of the old lawn by shoveling the grass, including 1 to 2 inches of top soil, then even the surface using a rake. 3. Spray the whole area with weed and grass killer to prevent unnecessary weeds from growing in your synthetic turf. And to add protection from unwanted plant and weed growth, you can cover the court surface with ground cloth, but be sure that it has the right measurements. 4. Scoop about 2 inches of fill dirt to the tennis court surface and smoothen it with a rake. 5. Place the synthetic turf securely. Some turfs come in large rolls while others are pre-cut into squares. Make sure that the entire court will be covered by the fake grass. 6. Pour the filler sand evenly from corner to corner of the court surface. You can then use a push broom to even the sand and rumple the synthetic turf. Now, if you are not so skill full when it comes to installing structures, then it is best to ask for professional help from a reputable company. Look for a company that are knowledgeable and experienced with synthetic lawns, from planning to installation and their services and products are of high quality and worth every cent.